I had taken this photo a few years ago and, appropriately, not only does it fit the theme of the challenge, but it tells a story in many ways. 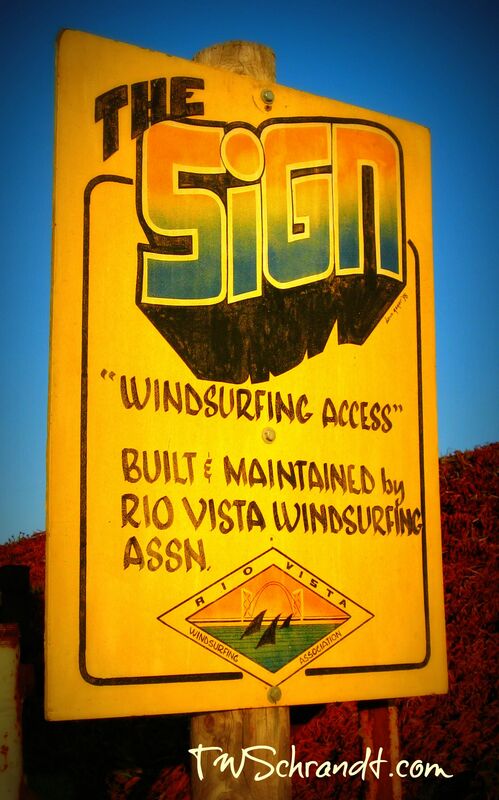 Little did I know when I saw this sign of “The Sign” that I would spend incredible leisure moments, days, weeks, years here, learning one of the most difficult sports to master–windsurfing! I blame my husband. Not only did I learn two amazing water sports, including stand-up paddling, I made new friends and built relationships. Not to mention an inexpensive place to camp and spend summer weekends by the water. Here is a description of “The Sign.” and more information on the RVWA website if you are curious! Marked by a large sign warning any dredgers of an underwater cable, this site offers good waves and has become a popular windsurfing site. What’s your sign, or rather, what signs point the way to leisure? I also want to take this moment to thank Ed from Sunday Stills for 7 years of photography challenges. He has posted his last post and is closing the site down. Sunday Stills weekly photo challenges were fun and I enjoyed participating. Amazing how we found our signs. I love this photos– so bright and colorful. I agree with Julia– it is so full of your personality and I love it even more with the personal meaning it has behind it for you. Thank you, Britta, so kind of you to say! Aww, thanks, Julia, that means a lot! Still behind here is my Daily Post for this week.